The UNM Department of Biology at the University of New Mexico is one of the biggest academic units in the state. 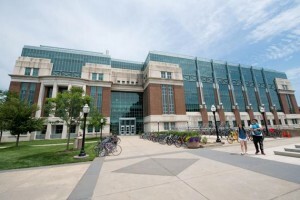 The department is comprised of 35.5 tenure track faculty (plus two full-time administrators with biology appointments and a faculty member on long-term leave), 8.5 faculty lecturers, more than 1,300 majors, more than 100 graduate students, and 89 staff and research support positions. Our non-majors courses, which are now taken by nearly two thousand students each year, serve as key entry points for the allied health sciences. Collectively, research activities generate $6–13 million per year, and the department is home to some of UNM’s most prestigious academic programs and faculty. Our faculty are productive, publishing more than 100 papers per year, including a high fraction of the state’s output in preeminent journals such as Science and Nature (from 2000–2007, 28% of all publications in Science and Nature from the state of New Mexico came from our department). They have have strong programs in ecology and evolution that embrace diverse programs in ecosystems ecology, plant population biology, behavioral ecology, metabolic ecology and collections-based studies in the Museum of Southwestern Biology. Lying in intermediate positions are integrative programs in parasitology and comparative immunology that cut across traditional disciplines, and at the cell/molecular end of the spectrum are programs in genomics, fungal biology and Drosophila development that also build on evolutionary themes. We have deliberately fostered the concept of a single, large, interactive department covering the spectrum of modern biology, one that blurs traditional boundaries and favors collaborative and multidisciplinary approaches.